Shower heads vary widely in the amount of water that they disperse, and the water flow isn’t directly connected to how strong the shower feels, either. The best shower I’ve ever had was when I was in college, where the dormitory had these enormous showerheads that dropped water on you from the ceiling. It felt much like standing in a mild rainstorm. The shower made it very easy to get clean and feel refreshed. After researching them (mostly because I wanted a similar setup in an apartment I lived in), I found that the showerhead was a very low-flow showerhead. However, the landlord didn’t like the idea of switching showerheads, so I used the one already in the apartment. The flow from that showerhead was intense, but much of it was wasted as it just ran right down the drain. At our current home, we have a showerhead in the master bathroom that’s somewhat similar to the one I loved in college. It produces about a gallon of water per minute, which is a pretty low rate, yet it provides a great shower experience. On the other hand, a friend of mine has an extremely high-flow showerhead. He lives in an older house, where the same showerhead has been in use for a long time. He grumbled a lot about the wasted water, so eventually he wanted to test it. He got a five gallon bucket and let the shower run into that bucket to see how long it took to fill up. It turns out that his older showerhead was producing somewhere around 4.2 gallons per minute. So, let’s run the math here. My low-flow showerhead produces 1.0 gallons per minute. His high-flow older showerhead produces 4.2 gallons per minute. That means over the course of a ten minute shower, his shower is going to use 32 more gallons of water than mine. What does that mean over the course of a year? Let’s say we’re looking at an average of two showers per day among the residents of the home. That’s 23,360 gallons of water wasted in a year. Depending on your local water rates, that’s going to be somewhere around $40-50 per year in wasted water costs. There’s another cost, too: heating that water. Let’s say half of that water comes out of the hot water heater. You’re going to be paying to heat 12,000 gallons of water for an average of 24 hours over the course of a year. Again, depending on your home energy costs, this is going to cost you somewhere around $40 in energy costs. If you have an older showerhead, replacing that showerhead will save you a lot of money even if you invest in a very expensive showerhead that provides a great shower experience. If you want to know whether you should replace your showerhead, put a gallon bucket into your shower (or a larger one with the one gallon level clearly marked). 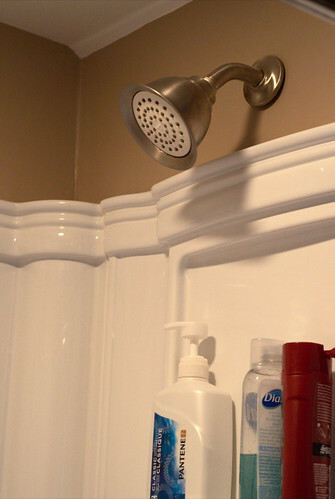 Turn your shower on, then see how long it takes for the bucket to fill to the one gallon mark. If it fills in twenty seconds or less, then you should strongly consider a new showerhead (if it fills up at the twenty second mark, your head is producing 3.0 gallons per minute; if it takes less time, the rate is higher). If you can easily chop a gallon per minute off of your water flow in your shower, you’ll save some money by switching showerheads. Shaving one gallon per minute off of your showerhead – assuming you take one ten minute shower per day in that shower – will save you 3,650 gallons per year, which will approximately trim $5 off your water bill and $3-4 off your energy bill each year. If you use the shower more or shave more off of your flow rate, your savings will go up far more than that.